Do you remember the opening scene of Bridget Jones’ Diary? It begins with Bridget having a moment of sad-life epiphany at a family New Years Day party. She realises that unless something changes she is going to end up sad, and alone and found dead in her apartment half-eaten by Alsatians. That is the moment that inspires her to buy a diary and set up her New Year Resolutions to take control of her life. I really relate to that moment. After Orla was born I lived in a strange state of exhaustion for a number of months. My brain was in a fog of sleep deprivation, breastfeeding and nappy changes that took twenty minutes because I dropped a dirty nappy on my knee and now everything is covered in poo. They were the weeks that I just had to get through each day and remember to enjoy the cuddles, oh and rely on the support of my Mum, who would pop round each day, wash up, make me food and send me up for a nap every afternoon. God bless my Mum! But after a few months Orla eventually started sleeping more and breastfeeding less. I got some energy back and my brain kicked back into gear. And there came a moment when I realised I had to get back in to the habit of doing my own washing up and sorting out my own lunch. I wanted to pick up my old hobbies and responsibilities and I wanted the house to have some resemblance of order, and of course, I wanted to take good care of Orla. So, like Bridget I turned to my diary and wrote down ‘The Rules’ to help me get control of my life. Rule 1: Orla comes first. Rule 2: Give Rob your full attention. Put your phone down, he is more fun anyway. Rule 3: Do the daily household tasks every day without fail. If you are curious my daily household tasks that I set myself (and yes I do have a chart for tracking this…) are make the bed, wash clothes, check/empty bins, wash up, wipe down kitchen counter and high chair, tidy up for 20 minutes, and put clothes away at the end of the day. Rule 4: Ask Rob for help. Rule 5: On Tuesday/Wednesdays/Saturdays and Sundays do 2 or 3 of the weekly cleaning tasks. The weekly cleaning tasks are: vaccuum, clean bathroom, change bedding, dust, clean kitchen floor, check fridge for out of date food, iron and do an hour of gardening. Rule 9: Invite friends around on the weekend. Make lots of plans, you never regret spending time with friends. Rule 10: Your brain turns to mush in the evening so switch off and unwind after 8pm. Go to bed early. Rule 11: If it is sunny enough to sit out in the garden and read a book then do it! All housework rules are cancelled. Rule 12: You can do most of these things even if you feel a bit tired but when you are sleep deprived do whatever gets you through the day, all rules are off! Some of these rules I keep really easily, some of them (hello Housework! )I am still rubbish at, but these rules do help me by giving me a plan of what to do when I feel overwhelmed by things. They also give me a little kick in the backside when I am being lazy and they remind me of the important things in my life; my baby, my husband, my friends and my God. June has been a lovely month for our little family. We have fit in two mini-breaks and have made the most of the sunny weather. Here is a snapshot of this month. Treasuring the memories we made on Orla’s first visit to Ireland. We spent a perfect weekend with Rob’s side of the family. It was our first time taking Orla on a plane, and she slept through the entire flight there and back! We played on the beach, visited gardens and spent lots of time eating with family. We loved every minute! Nitpicking Orla’s reading material. This buggy version of the very hungry caterpillar has irked the pedantic in me by labeling a plum as ‘blue’ when it clearly purple, or indeed plum! What is the world coming to? Jumping on the Unicorn trend and ordering a Unicorn Hot Chocolate at a Hipster Chic Coffee bar in Clitheroe, Escape Coffee and Cocktails. Orla was more interested in Rob’s banana milkshake, which was good as I certainly did not want to share! Drinking in the view from a cocktail bar looking over the river in Bristol. Last week we took another small holiday to Bristol and met up with our friends who also have kids. We took it in turns to go out, and one of my best moments was sitting on a terrace, eating chocolate torte looking out over the river at a very late sunset. Stopping to smell the roses. On our way back from Bristol we stopped at the Trentham Estate, just off the M6 near Stoke on Trent. It broke up the journey back home and gave us a really fun day out exploring some stunning gardens. These roses gave off such a lovely scent it was hard to leave them behind. A good movie is great comfort to the soul. I remember that Glee episode where it is revealed the Mr Schuester watches Singing in the Rain every time he is sick and I know I am exactly the same. When I am sick, tired or drained there is nothing quite like revisiting a story with familiar faces and reassuring promises that good will triumph over evil in the end. This is my favourite romantic comedy of all time. It is delicious eye candy from start to finish. Overly stylized with superb sixties outfits, fake and romantic back drops and a score that punctuates every joke in this zany farce. It’s sweet, funny and bright. Perfect for when you need cheering up, not so good if you are on a diet; chocolate is heavily featured. Oh and it has the tightest script, not a single line is wasted and they pack so many jokes into 90 minutes that the time will fly by! I can recite this movie, word for word by heart but if it comes on the telly I will watch it again. It is all so perfectly done. 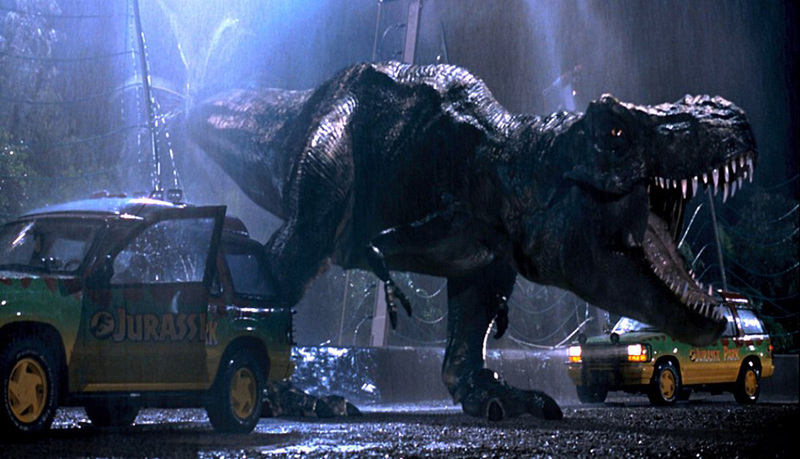 The T-Rex attack, the build up of the raptors as the most deadly animal, the beauty of the special effects that are so good that you accept the dinosaurs as they are. Not to mention the brilliant characters who nearly all get a proper character arc. And that music score that lifts your heart as the helicopter sweeps over the island. Pure Blockbuster perfection! The day after our wedding Rob and I checked into a hotel at Manchester Airport so that we would be ready the next morning for our flights to our Honeymoon in Turkey. I was very happy, but also very tired. My mind was still in ‘to-do list/organisational/event planning’ mode even though there was no more event to plan. I just couldn’t switch off. Then Rob turned on the TV and the Fifth Element was on, we both collapsed on the bed and with the help Bruce Willis, Mila Jovovich and a flying ball of dark matter heading straight for Earth, we gently came down out of the wedding buzz and began to relax. Lake Placid borders somewhere between tongue-in-cheek horror and outright parody of creature horror movies. It’s funny more than it is scary but it will give you second thoughts about paddling in the nearest lake. I have strong memories of watching this with my friends as a teenager and I still think it is hilarious today especially the cranky old lady mouthing off to the police! Bing Crosby, Grace Kelly and Frank Sinatra singing and lounging around a millionaire’s palatial home. They exchange sharp barbs and cool wit over coffee, drink cocktails by the pool, and misbehave in a the most glamorous pre-wedding shindig you will ever see. I love every minute of it! Getting the most out of the Bank Holidays. Last Bank Holiday Monday we got up and out of the house for half nine and headed straight to Spring Wood in Whalley for a walk around the bluebell filled woods. It was brilliant! Orla loved exploring the paths and it was a challenge to keep her still enough to take a couple of photos. We left just as the car park was getting busy and headed off for brunch! Reading blogs again. I had gotten out of the habit of flicking through my blog reader but I’ve recently taken it up again. I use BlogLovin on my phone and laptop to group all the blogs I follow together. I am currently really enjoying Cupcakes and Cashmere for sunny LA fashion and Marcus Design for beautiful interior designs. Gardening. The garden is the main reason why we bought our house. It is massive, practically a small field. The look we are going for is part English Cottage garden and part wildflower meadow. We are letting a large segment of the garden grow wild and try to encourage natural wild flowers and bees as much as possible, we have an impressive sweep of forget-me-nots and bluebells at the moment. Then we have a patch of tidy lawn and a full flower bed near the kitchen door. There is always more jobs to do then we will ever get to but it’s so cool to see what changes have taken hold now that we are entering into our third year of living here. Marveling at Orla’s independent spirit. We took her to Blackpool’s Sea Life Centre last weekend and try as we might we could not get her to pay any attention to the many wonderful sea creatures there. Instead, all she wanted to do was dance in the pretty seahorse light they were beaming on the floor. I guess this is how we know we are entering into the toddler world! Little Miss Strong Will! Watching Taskmaster. Every Tuesday night, 9pm on Dave is the most random comedy game show that is an absolute joy. Five comedians complete silly games and tasks to be awarded points by the taskmaster; Greg Davies. Any description doesn’t do it any justice but it is good natured and it really makes me laugh each week and I find it is perfect for helping me unwind from the day and go to bed happy. February has been a full month, we have had a window added to our bedroom, installed fitted wardrobes and had a mini-break in Wales with some lovely friends. Here is what going on in my life at the moment. Walking in the park more now that the sun is staying out for longer. This photo does not do justice to a beautiful reflected sunset I saw the other week. I am so grateful for having a park so close to our house, it does me such good to just get outside for a few minutes and get some fresh air. Blinking in the brightness of this colourful array of yarn. I discovered this gorgeous arts and craft shop in a tiny Wales village called Montgomery. The shop was small and crooked, all the floors slanted and the door frames were wonky, and there was a ginormous but friendly Irish Wolfhound sitting by the tills. It was a bit like being in Wonderland! Playing with Orla. Now that she is a fully fledged one year old, Orla’s repertoire of games has vastly expanded. She now likes playing with stickers, bubbles and pouring her drink on to the carpet whenever I am not looking. Going all out for movie night. Last week we decided to do movie night properly. We rented classic Sci-Fi film Dune. We pulled the sofa up to the telly, dimmed the lights and lit candles. Rob made popcorn and salted caramel from scratch and I poured the wine. It was bliss! Think we might do the same this weekend. Jumping on the Bullet Journal bandwagon. I have been using this journal to track my goals and to-do lists since January. The biggest change it has helped me to make is to keep on top of the house work. I have a list of 8 daily household chores and 6 weekly or fortnightly chores. Even though I rarely tick everything off, I find I am getting a lot more done and the housework is feeling more manageable. I now take this journal with me everywhere I go, it my top new accessory! ‘Whistle while you work’ chirped Snow White as she briskly swept the floor of the little woodland cottage, whilst the deer and blue birds joined in the spring clean. Instead of a squad of forest critters to help me clean the kitchen, all I have is a one year old baby who likes throwing my biscuit cutters on the floor whilst laughing manically. However, with or without help I have found that connecting my phone to the bluetooth speakers and blasting out the tunes whilst I cook and wash up does really help to make tea time a fun part of my day. So I have been treating myself to downloading a song once a week to add to my playlist. Here are the latest ten songs that I have been listening to: (Warning: they are nearly all old cheesy songs!). I have added links to the end of each song so you can have a listen for yourself. A Star is Born By Disney, Hercules. This full throttle Gospel tune is great for an energetic and private kitchen dance party. Gives ‘goodnight kisses’ every evening. How am I filling my days in 2017? Well, currently I am…. Working again. My year of maternity leave has come to an end and I have returned to work part time. So far, I am really happy to be back and it has made for a nice change. As amazing as my daughter is, it is nice to be able to get up and leave a room without having to either carry a baby with me or rush and get something before she figures out I’ve gone. Sleeping through! Another big change is that I am now sleeping through the nights! I can’t tell you how amazing it feels to wiggle down into bed and know that I don’t have to get up till morning. Unfortunately, Orla still wakes up a couple of times but for the last two weeks our strategy has been that Rob is dealing with her instead of me. This has weaned her off the night feeds and has given me a break from the sleep deprivation. Hurrah! Meeting Rodney, my friend’s gorgeous new puppy! He is a cross between a Pug and a Collie and he is extremely adorable. We have planned to do a baby/puppy meet up every week and once he has had all of his injections I think we will be doing lots of excursions to the park together! Celebrating Orla’s birthday. My little girl is now one years old. We marked the occasion with a little party for her. She wore a pink dress and a party crown, got some exciting new toys, tried a bit of birthday cake and ate her body weight in grapes because she kept conning different family members to pass her more food! She is savy one! Appreciating the winter evenings. Normally in January I get fed up of the dark and cold and am just willing Spring to hurry up and get here but this year I am actually still enjoying winter. Candles in the evening, soup with chunky wedges of bread and misty mornings, there is still a lot to appreciate! Five years ago today Rob asked me to marry him. It was perhaps the easiest question I have ever had to answer and I want to share why. I have read a lot about ‘red flags’ in relationships; things or attitudes that act as warnings that the relationship is not going to work. Well, I thought I would share five green flags that were a ‘go ahead’ signal to give my heart to Rob. For a relationship to truly work well there has to be unity on what you believe are the most important things in life. For me, my big things included my faith, a desire to settle into a home and start a family. I knew I needed someone who shared those big goals. I would have been a terrible match with someone who wanted to travel the world because I would always be more concerned with saving a deposit for a house. Whatever we did one of us would always be resenting the other. As it happens, Rob is a keen traveler and has done a fair bit in his twenties but when we got together he too was setting his heart on building stability. Knowing that we wanted the same things was a big green flag that we could help one another build the life that we both wanted. I remember when we first started seeing one another I kept a count of how many days in a row that we saw one another. I normally enjoy my alone time and need breaks from even my closest friends to recharge, but when Rob and I spent 21 days in a row together and I still wanted to see him on day 22, I knew that something special was happening. In the simplest way I just enjoyed being with him and it was easy to be in his company. It wasn’t an effort, I never worried about what he was thinking or how I looked or how to fill the time. We didn’t second guess one another and we didn’t exhaust one another. It was easy, fun and felt comfortably normal; like this is how life is supposed to be. It was bizarre! I didn’t even want children back then. I knew nothing about Rob apart from his name but I just felt a very strong instant attraction. Five years later, when circumstances allowed us to spend more time together the attraction was still there. Butterflies in the stomach, goosebumps when you touch, shivers down the spine. There has to be a physical attraction. No matter how many jokes people make about the ‘friend zone’ the truth is that romantic relationships need to have the spark. There are plenty of good guys out there but you need one whose smile flips your stomach. That sounds wrong but hear me out. One of the things I soon found reassuring about Rob is that he has a number of female friends with whom he has never been romantically involved, because it shows that Rob doesn’t just see women as potential partners; he views them as people; interesting, funny, complicated people. It meant that Rob would see me as a whole person too. Not a trophy girlfriend, not as a hysterical woman, he would see and treat me as a person, with thoughts and feelings that are as valid as his own. This can be a difficult issue for people who have dealt with cheaters in their past because insecurities will mean that you view other women as threats to your relationship. But the truth is that Rob’s female friends are now my friends too and our life is stronger and richer for having them in it. Rob set up this blog for me when I said that I wanted to write more. When I said I was feeling a bit lonely he made sure we made plans with friends. When I get stuck on a project he helps me. When I say ‘I am not sure I can do this’ he tells me I can and helps me work out how. He is invested in my dreams and ambitions and I am invested in his. We become cheerleaders for one another. Your partner should be that voice in your life that says ‘you’ve got this’. If you find someone who cares about you doing the things you love then hold on to them, love them, marry them. Investing in your dreams is a huge neon green flag to go ahead, that this is true love. Rob and I have a Christmas tradition of doing a time lapse video when we put the tree up and this one is extra special as it is Orla’s first Christmas Tree. Turns out putting up a tree with a walking 11 month baby in the mix is a lot of fun! Her favourite thing at the moment is exploring the rooms downstairs so you will see on the video that she keeps wandering off and then one of us had to go and herd her back to the living room! The other change I made this year to the tree is to get some bushy red tinsel. I love tinsel but I think it is a bit out of fashion at the moment, I think people think it is a bit tacky. But I think it adds a sense of warmth and fullness to the tree so I am really pleased to have some this year.